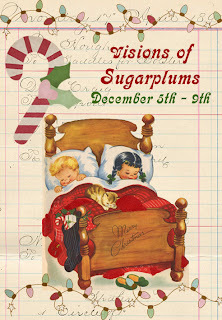 Do you have Visions of Sugarplums dancing in your head yet? We do! Mika, of Mika's Pantry and I are hosting a fun Christmas blog party and you're invited! We'll have recipes, traditions, Christmas creations and how-tos. Ira, Linda, Jennifer, Lauren, Regina and Cassie will be joining us along the way. And we can't wait to see their posts! We'll even have giveaways: Regina from The Cutting Cafe will be giving away some of her awesome Christmas sets, Beatrix Jennings from Iralamija's Shop will offer two collage images of your choice, and Cassie from Paper Issues will have a treat, too. I'll have two huge giveaways that will include vintage Dennison goodies! 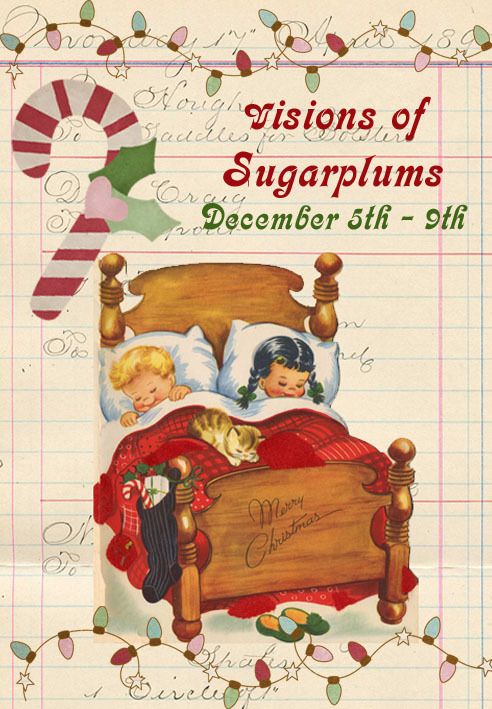 Be sure to join us Monday December 5th, when the fun begins and come back each day through Friday, December 9th to see all the fun of Visions of Sugarplums! Sounds sweet! I have a yummy treat to share! How exciting! I can hardly wait, love the badge. Do you mind if I copy it w/ link to your blog to advertise for you? This sounds so fun! I'm so glad I found your blog! Sounds like fun!! So glad I get to play along..
Vim aqui conhecer seu blog, através do blog da Ira e adorei!!! I'll be sure to put up a post this week about it! Looking forward to everyone's posts!